Lexus has zoomed back into the race with its German competitors for the luxury sales crown that it once owned. But it's not even close to matching the breadth of the product offerings that Mercedes-Benz and BMW, as well as fast-growing Audi, have shoveled into the U.S. In the next few years, Lexus will fill some of the holes, with a rethought entry-level CT, a new three-row crossover above the RX and even a high-zoot coupe at the top of its lineup. CT: Since this car is largely based on the Toyota Prius, a redesigned CT should follow the upcoming fourth-generation Prius and go on sale in 2016 as a 2017 model. This means it also will ride on Toyota's new TNGA modular platform. Given the recent onslaught of entry-level luxury sedans (Mercedes CLA, the upcoming BMW 1 series, Audi's new A3 and the re-engineered Acura ILX), the CT could switch from its hatchback layout to a sedan. IS: In 2016, the outdated 2.5-liter V-6 in the rear-wheel-drive IS 250 will be kicked to the curb in favor of a 2.0-liter, turbocharged four-cylinder, while the IS 350 will keep its V-6. An aesthetic freshening will follow in 2017 before a full redesign in 2019. ES: This car gets a light freshening for the 2016 model year, details of which were revealed at April's Shanghai auto show. As with the Toyota Avalon that the ES is based on, the V-6 sticks around, as it will when the ES is redesigned in 2019 and switches to Toyota's modular platform. RC: New for 2015, the RC 350 and RC F are based on a mix of the GS, IS and previous-generation IS convertible. 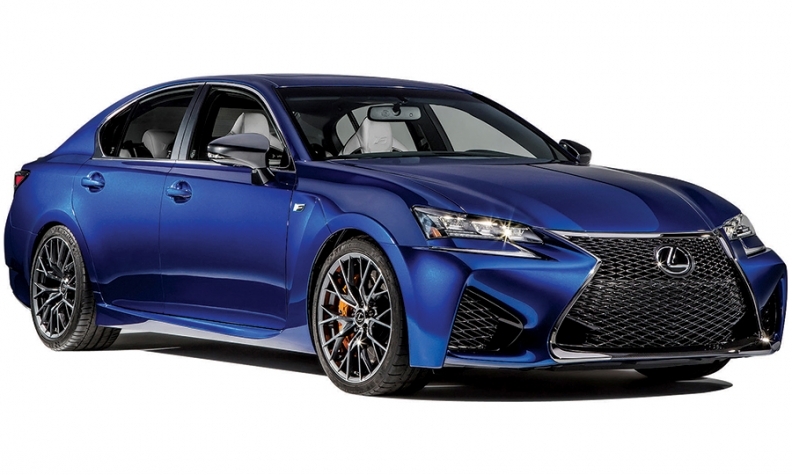 The RC 350 comes with a 3.5-liter V-6, while the RC F packs a 5.0-liter V-8 that it will share with the upcoming GS F.
The GS F, packing a 5.0-liter V-8, will go on sale by the end of 2015. GS: A freshened version of Lexus' midsize sports sedan should debut this fall, and it could add as a base engine the same 2.0-liter, turbocharged four-cylinder that's headed for the IS. This would follow a trend in the segment, as Audi, Cadillac and BMW all offer their midsize sedans with a 2.0-liter turbo. The GS F will go on sale by the end of 2015 with the 5.0-liter V-8. A redesigned GS should bow in 2019. LS: A redesigned LS should land in 2017 as a 2018 model. The basic recipe -- V-8 power and rwd -- remains unchanged, though it's possible a base model with a V-6 engine will join the fray. The LS 600h L hybrid almost certainly dies a slow death, though in its place could be an LS that uses parts of the hydrogen fuel cell powertrain from Toyota's Mirai. Given the low volumes the LS 600h sold in, it's feasible that Toyota's production capacity for fuel cell stacks could spare enough for this variant. LC: In late 2014, Lexus trademarked a pair of names: LC 500 and LC 500h. They are widely understood to be coupes based on the rwd LS sedan. Consider these spiritual successors to the old SC coupe in a way that the current RC coupe is not. As the name implies, they'll likely use Toyota's 5.0-liter V-8, and they will be priced between $80,000 and $100,000. The styling should echo the dramatic LF-LC concept that Lexus has shown at several auto shows, though it will be tempered slightly for production. The coupes are expected in 2017. 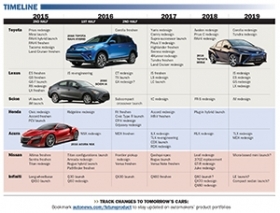 NX: Lexus' new compact crossover went on sale late last year with the choice of a 2.0-liter, turbocharged four-cylinder or a hybrid drivetrain. It's based on the Toyota RAV4 and has been huge for Lexus sales, fueled by low gas prices around the country. RX: A redesigned RX goes on sale by the end of this year. It's the brand's top-selling nameplate in the U.S. and is largely credited with igniting the luxury crossover wars. As with the previous generation, the 2016 model will come in V-6 and hybrid versions. TX: In 2016, Lexus is expected to introduce the 2017 TX, a new three-row crossover largely based on the slightly smaller RX. It will use the same drivetrains and will be positioned just above the two-row RX. GX: With the new TX coming to handle three-row people-hauling duties for Lexus, the future of the GX -- a body-on-frame true SUV -- is cloudy. Helping its case is cold, hard cash: Because it's based on the international Prado SUV platform (which also underpins the Toyota 4Runner), this is Lexus' most profitable vehicle, by a wide margin. And since Toyota is building it for the international market anyway, it may be hard to resist the money a GX promises, even if it means very low sales figures. If a new model comes to the U.S., it should arrive in 2016 as a 2017. LX: Lexus will debut a heavily freshened LX 570 with significant body and interior improvements later this year in an effort to keep its full-size Range Rover fighter current until a full redesign debuts in 2019.